Throughout Western history the Arts have influenced how we feel in society. Today this role is mostly played by the news media. Perhaps art can still be useful in revealing and elevating this process. Only the good/bad is an Emotional News mapping machine. 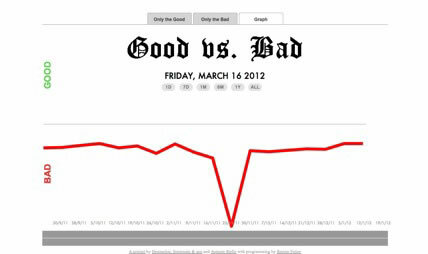 It attempts to classify each headline served by the major news services such as GoogleNews®, Reuters® and AssociatedPress® as either good or bad news (that is, it decides if the news item has a positive or negative Emotional Hit) and then plots the result on a graph and creates Only the Good.org and Only the Bad.org newspapers, all in real-time. On rare occasions the algorithms would misinterpret a news item due to the intentional or accidental use of complexities in the english language by the news media - for example a headline such as "Sick Transit's Glorious Monday" is difficult for an algorithm (or a human) to classify as having a good or bad emotional hit. For these ambiguously worded headlines the authors could step-in and correct the false hit and the program added the new lesson to its ever-growing Emotional Database. Over the year of its running, the program became uncannily accurate in its predictions and functioned as a completely automated public release. The authors offered both Only the good and Only the bad RSS news feeds for anyone to share, as well as a portable version of the Emotional News Graph for social media sites and mobile devices. An Only the Good/Bad radio broadcast was also available. 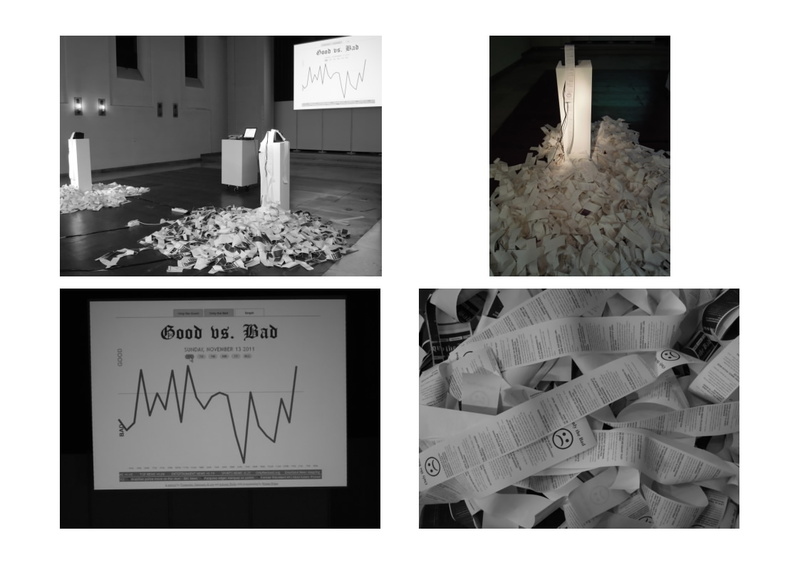 Please see here for the installation view of Only the Good as it was presented at the solo show in KVN, Stuttgart, Germany.